The paper presents an original and fast method for the heat recovery steam generator (HRSG) exergetic optimization. The objective is maximizing the exergy transfer to the water / steam circuit. The proposed approach, different from the classical method that fixes the pinch point, is essentially thermodynamic but it considers also the economics by imposing the total heat transfer area of HRSG. The HRSG may have one or two steam pressures, without reheat. The input data from the gas turbine are: the mass flow rate, the temperature and the molar composition of flue gases. The results are the optimum pressures of the superheated steam. The numerical computations were realized in Delphi programming utility. The obtained results are in agreement with the recent literature. ISNAD Cenuşă, Victor-Eduard , Badea, Adrian , Feidt, Michel , Benelmir, Riad . "Exergetic Optimization of the Heat Recovery Steam Generators by Imposing the Total Heat Transfer Area". 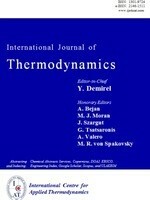 International Journal of Thermodynamics 7 / 3 (September 2004): 149-156.